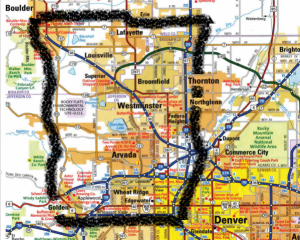 ROCKY FLATS DOWNWINDERS | A community organization advocating for residents living downwind from Rocky Flats. 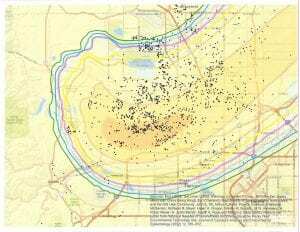 Are you a Rocky Flats Downwinder? DOWN-WIND-ER: A person living downwind of a nuclear test site, weapons plant or reactor, where the risk from fallout or radiation leaks is greatest. The Rocky Flats Plant operated from 1952 until 1989 as part of the United States’ nationwide nuclear weapons complex. The Rocky Flats facility manufactured plutonium trigger mechanisms for nuclear weapons from various radioactive and hazardous materials. Manufacturing activities, accidental industrial fires and spills, support activities, and waste management practices contaminated soil, sediment, groundwater and surface water with hazardous chemicals and radioactive constituents. Dr. Mark Johnson, Head of Jefferson County Health Department wants independent testing. Hear about his concerns here. 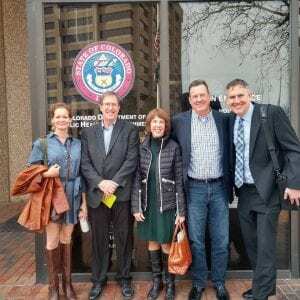 Rocky Flats Downwinders Meets with CDPHE’s new Executive Director, Jill Hunsaker Ryan joined by Dr. Mark Johnson, head of Jefferson County Public Health Department, Dr. Sasha Stiles, Randy Stafford and Nick Hansen, Esq. DO YOU WANT YOUR SOIL TESTED? 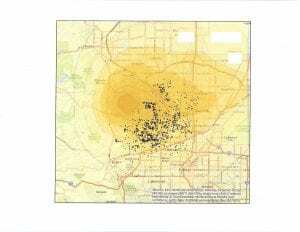 In 2015 Metropolitan State University released Preliminary Results of its Health Survey of Rocky Flats Downwinders. Data pertaining to illness was geoplotted on a map of the survey area. Two sourced maps of contamination from the plant in the form of radiation and fires were overlaid on the geoplotted data to identify possible correlation between illness and radiation exposure in the area.iii The results are anecdotal, compelling, non-conclusive. In November 2018, we were notified that Rocky Flats Downwinders was awarded a grant for our pilot Hemp Phytoremediation Project. We have Experts guiding us and advising us. Stay tuned for more information. Keep Rocky Flats Closed Forever. Contact Colorado members of Congress and tell them to Keep Rocky Flats Closed. We support Dr. Mark Johnson, Executive Director of Jefferson County Health Department.